Transtech has extensive experience in managing the operation of the Building and Safety Division in several client cities, providing a range of expertise necessary to carry out the normal and day-to-day activities and functions of the Division. This includes, but is not limited to providing professional services in all of the following areas: Building Official services, development review of new projects, counter assistance, plan checking, building inspection services, and building code compliance. Transtech provides the most efficient and timely customer service possible to meet the needs of the community and the City’s patrons, responding quickly and effectively to the walk-in, telephone and electronic inquiries of the public related to Building and Safety services. Our firm, when required, will help develop, establish or recommend City policies and procedures to maintain or improve City’s Building and Safety operations. 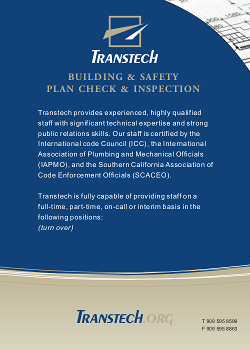 Transtech works closely with all City departments and ensure the appropriate requirements of those departments are incorporated in the Building and Safety Division’s operating standards and processes. In the event of a local or regional emergency or disaster, all on-site personnel provided will be accessible, available, and prepared to provide Building and Safety services as directed by the City.